SuperGIS Server is designed for giving the organizations with the ability to create, manage, integrate and publish the various types of GIS services. With SuperGIS Server, the spatial data and image in all types as well as GIS functions can be applied as GIS services in desktop, mobile and web applications over the Internet. Besides basic functions like dynamic map, static map tile, data editing and so on, the newest SuperGIS Server 3.1a additionally supports function of publishing Geoprocessing Service to provide the custom websites in diverse projects with more professional analyses. To provide comprehensive and flexible geoprocessing function and meet diverse custom requirements, SuperGIS Toolkit in SuperGIS Desktop 3.1a allows users to define the combination from hundreds of basic processing functions. Meanwhile, according to users’ requirements, they can also purchase Analyst Extensions, including functional groups (e.g., 3D Analyst, Spatial Analyst, Network Analyst, and Spatial Statistical Analyst) which enable custom website to provide more professional analysis functions. Building process design of Network Analyst by SuperGIS Toolkit was introduced before. This time, we utilize SuperGIS Toolkit introduce how to design process of Spatial Statistical Analysis. Spatial Statistical Tools contain Data Analysis subgroup and Kriging subgroup. In Data Analysis, “Regression Analysis” (for returning equation coefficients or outputting calculated values as table) and “Field Statistics” (for calculating Average, Minimum, Maximum, Median, Quartile 1, Quartile 3, Variance, Standard Deviation, IQR, Skewness, Variance Coefficient, and Kurtosis Coefficient) are provided. And Kriging offers functions like “Create Statistical Model”, “Calculate Z-Value”, “Calculate Z-Value as Raster” and so on. 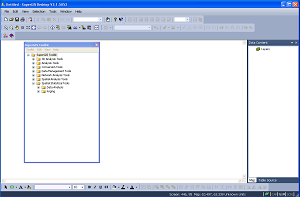 As long as you use SuperGIS Desktop with licensed Spatial Statistical Analyst, you are allowed to utilize Spatial Statistical Tools functions of SuperGIS Toolkit. If not, you still can design process of Network Analysis through Process Designer, save the designed process in the project of SuperGIS Desktop, and then run the project through SuperGIS Desktop with licensed Spatial Statistical Analyst or publish services through SuperGIS Server Standard or later edition with Spatial Statistical Extension. 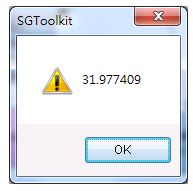 Then, users need to create a new toolkit in SuperGIS Toolkit or adopt an existing toolkit, name the toolkit, and add new process under the specified toolkit to call Process Designer dialog. 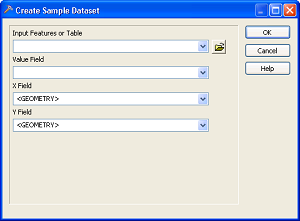 Before conducting Spatial Statistical Analysis, users need to build Sample Dataset required for statistical requirement. 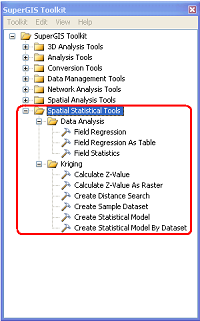 Firstly, add the built Process into Create Sample Dataset of Spatial Statistical Tools\Kriging and set required input parameters. 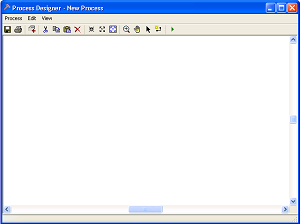 Object with white background means that there are still some required parameters blank. After accomplishing parameter settings, the blue rectangular object represents function itself; the orange elliptical object represents input data or output of other Process; and the purple elliptical object represents output data of the process. The next step is to build Statistical Model. In addition to using Create Statistical Model By Dataset, we can also employ Create Statistical Model that we need to input Sill value and Range value instead of inputting Dataset. Drag the object into the Process and build relation between Output Dataset and Create Statistical Model By Dataset. Then set the calculated Z-value (Output Value) object as process result, we will see a superscript, R, on the upper right of the object. The R superscript represents the final output value of the whole process. If you operate the process, the calculated value will be shown. And if we adopt RunProcess method of SGToolkit component to run this process, we can obtain the final calculated result by using GetLastResult method, too. We can query pixel of this raster layer on the map by utilizing Identify tool to estimate the Z value. This is the introduction of an essential building process of Spatial Statistical Analysis. If you want to publish this process onto the Internet through SuperGIS Server Standard or higher edition, please refer to details in SuperGIS Server help.